How many times have been scrolling down your feed on Facebook (or whatever your favorite social media platform may be) and you see a post or meme that gets you a little rankled inside? How many times have you posted something on social media and someone (whom you may not even know) seems hellbent to start a confrontation with you that seems above and beyond the gravity of the actual post? The internet troll often seeks to provoke others by (seemingly) purposely being disagreeable, oppositional, insulting and so forth. I have been guilty of allowing myself to fall prey to these kinds of individuals in the past but over recent years I have gotten better at ignoring them and/or unfriending them. However, on occasion I still get sucked into going back and forth with a troll though I usually reel myself in pretty quickly. As someone who has worked in the behavioral health field as a foster parent for a number of years I have received copious training as to how to deal with a variety of negative behaviors. I have been reluctant to use these techniques when dealing with adults on an everyday basis because it feels manipulative to me but I intend to change my tune on that account. I have come to realize that there are not only “trolls” on the internet but there can be trolls in our everyday real-time lives as well. They can be family members, friends, neighbors, co-workers, etc. There can be people that seem to purposely instigate conflict by being disagreeable, “pushing your buttons”, taking opposite sides in discussions, being sarcastic, insulting, condescending and so forth. Always assume good faith initially. Keep your sense of humor. You may be able to joke them out of their misbehaving. Consider ignoring them. Troll behavior directed at you will usually stop if you don’t add fuel for them to play with. Take time for self-care. It is fairly easy to understand that the troll is the person with the problem, but that doesn’t mean it’s easy to let vicious comments roll off if your “Teflon” layer isn’t thick enough. Even journalists, politicians and movie stars who have had years in the media spotlight where troll-attacks are everyday events sometimes feel the sting of a particularly nasty interaction.So take time for self-care and reach out in ways that the troll cannot influence the people who love and support you. People who will tell you – repeatedly if needed – that the comments aren’t true, that you’re wonderful and that the troll is just a troll, not a reflection of you. Avoidance is the best policy: If you can catch them shooting their mouths off, totally ignore remarks left by trolls. Don’t feed the trolls should be stuck up on a yellow sticky always. Avoid arguments: If you do get on a one-to-one with someone you suspect to be a troll, keep your remarks to an absolute minimum. State your facts and move on. Put the ball in their court. By the second remark or so, a troll would have identified himself.Don’t let them flatter to deceive: There is a high chance that a troll will pay a compliment or two to ingratiate himself before he starts his attack. This is a tough one as there are many real admirers who do sugar coat their comments. If you feel exceptionally compelled to respond to a troll, don’t post long comments. Try to make any responses as short and concise as possible; it’s often best to use exceptionally bland statements such as “Thank you for your comments, which we shall give due consideration.” Your main objective is to disarm the troll’s chances of getting an emotional response from other users, which in turn will hopefully demotivate it until it gives up its attempts. This method is not fool-proof: it can at times achieve the exact opposite results depending on the troll and how you go about doing this. (from IMDb site) Remember, trolls feel rewarded by creating the biggest altercation possible. They want to get a reaction out of you. When you fight with a troll, he wins. When you reason with a troll, he wins. Any time that you give a troll attention, he gets exactly what he wants.The best way to deal with trolls is to ignore them. When you ignore a troll, he doesn’t get the satisfaction of creating an escalated conflict.-Help me, I’m being unfairly accused of trolling… Being accused of being a troll is painful and unpleasant. It’s always possible that other users will misidentify you as a troll when your intentions are good. How you respond to a troll accusation says a lot about you. Your goal should be to diffuse the situation.Start by stepping away from the situation. The last thing that you want to do is throw more fuel on the fire. Give all parties involved some time to calm down and gain perspective. Next, for a moment, assume that the other party had good intentions. They may have hurt you, but you may be able to find a solution working with them in a positive manner. Take an open look at the behavior and see if it’s something that you can change. If he says you’re a troll because you made many posts quickly, maybe your argument really would be more effective if you summed it all up in one post. If he believes your comments as hateful, perhaps you could try to rephrase your opinion with fewer charged words.If you aren’t able to come to a resolution after stepping back and working positively with the angry party, the best thing to do is to let it drop. If you engage in a bitter war of words in the public forum, you will only appear more troll-like. Use the same advice that we give above: The best way to deal with trolls is to ignore them. You’ve probably heard this phrase numerous times before. It’s the cardinal rule of being in an internet community, and with good reason. Avoidance is and has always been the best course of action, hands down. The majority of trolls thrive on the confrontation—after all, their singular goal is to get attention—so the more you ignore them, the better. Downvote their comments or block them if you’re on a forum that supports such features, and move on. It’s incredibly tempting, but try to ignore them the best you can. Don’t respond to them, not even to call them out as a troll, and they’ll go away. Even a simple comment like “please stop” or “go away, troll” can bring attention to their comments (either by lengthening the thread or, in some forums, actually causing that thread to move higher in the chain). If a troll returns to their computer with zero replies, however, or if their comment just floats to the bottom of the thread, they’ll go looking somewhere else for the attention they crave. Showing them that you can be baited, even a little bit, is just asking for more. I saw an article that suggests utilizing a Cognitive Therapy approach to engaging trolls. I don’t really think that it’s worth the time and energy to try to reason with the unreasonable. 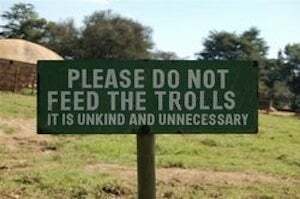 Don’t feed the trolls. Trolling is one of those rare problems best handled by ignoring it – if you do, it usually goes away. Trolls want your attention and discomfiture; they feed on your impotent rage. If they’re trying to be funny, your willingness to rise to the bait provides the punchline. If you don’t, there’s no joke. The secret to withholding attention is consistency: never respond. That way, the trolls can’t even be sure you’ve read their abuse. and they will most likely go about their (miserable) way.